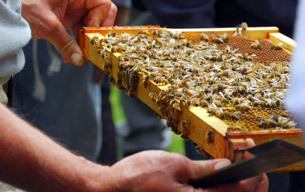 Beekeepers needed! Please participate in the National Colony Loss Management Survey organized by the Bee Informed Partnership and sponsored by the National Institute of Food and Agriculture (NIFA). Please go to our online survey at http://10.selectsurvey.net/beeinformed/TakeSurvey.aspx?SurveyID=BIP2015 and complete the survey there. It will be live on April 1st and close on April 30th. Please do not complete the survey more than once. Information about past Winter Loss and National Management Surveys and the annual reports can be found online at http://beeinformed.org/. The Colony Loss Survey has evolved from our winter loss survey because last year we found that commercial beekeepers lost 25% of their colonies over the summer, and so we are now starting to monitor and report annual, in addition to winter losses. The National Management Survey is conducted annually in conjunction with the Colony Loss Survey. Designed to take about 30 minutes, the 2 surveys are aimed at looking for relationships between colony loses and colony management (including disease treatment strategies, supplemental feeding, etc.) and/or other factors that may influence colony health (such as colony location, honey production, and forage type). Your participation in this research is voluntary and your responses will be kept confidential. In any publication or presentation resulting from this research, no personally identifiable information will be disclosed. If you have any questions or comments, please contact us at askbeeinformed@gmail.com. Once again thank you for your participation.